Transfer Pump is also named as Transport Pump, They are widely used for Crude Oil Transfer, chemicals liquid transfer, wastewater treatment transfer and other fluid medium transfer applications. Typically used as one of surface well testing equipment. 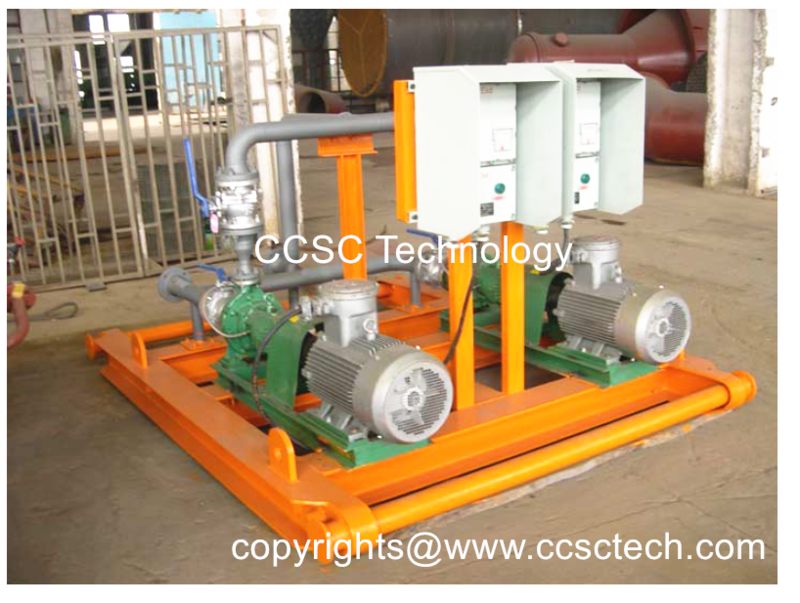 We CCSC Transfer Pumps typically application include pumping oil from a surge tank or gauge tank to burner, pumping oil from surge tank gauge tank into downstream existing flowline or other storage tank vessel, it is usually fitted with explosion-proof electrical motor for operations in Zone 2 regions.it can also be fitted with diesel engine for remote location operations. Our transfer pump allows the transfer of oil from a tank to a burner or an existing flow line to a tank trailer. In some special working condition, our high flow rate transfer pump can be used to inject oil production into an existing flow line. Our high, medium and low flow rate pumps are usually powered by electric motor, sometimes it is can also possible to have diesel driven varieties of the medium. Centrifugal type is most popular for well testing crude oil transfer application, Centrifugal pump contains a central rotating wheel, the impeller, that uses centrifugal force to impart high velocity to the liquid, and then converts most of this velocity to pressure. Centrifugal pumps operate at relatively high rotation speeds. Usually Centrifugal pump is suitable for high speed and low viscosity fluid, Screw pump is better for handling high viscous and large particles fluids. This transfer pump is supplied in a complete skid. Both Gear type, centrifugal type and screw type structure can be designed as optional. Customizable Transfer Pumps can meet our clients ‘service condition. ●Can be used in remote locations when fitted with a diesel engine, or in Zone 2 regions when fitted with an electrical motor.